Is using mouthwash as effective as flossing? Don't believe what advertisers sometimes suggest, nothing can match the level of effectiveness possible with flossing. Mouthwash vs. Flossing - Which one's better? Dentists and hygienists get this question from their patients all the time. Can I just rinse with a mouthwash instead of flossing? We'll, we hate to be the bearer of bad news for some people but the answer is no. Mouth rinses are not an effective alternative to using dental floss (in the sense of having an effect on the bacteria that live in between your teeth). And despite what you might see alluded to in advertisements, there isn't any question about this point. Flossing involves mechanically scraping dental plaque and debris off tooth surfaces. Using a mouth rinse does not. And because of this difference, the two don't compare. Mechanical cleansing is an important factor. Just like a toothbrush whose bristles scrub the exposed surfaces of teeth to remove plaque and debris, dental floss is a tool intended to scrape these same types of things off those areas where your brush can't reach. Of course, this point assumes that you're using proper flossing technique. That means one where the string is held against the side of your teeth as you slide it up and down their full length (including below the gum line), and not one where it's just popped in and out of the contact point where any two touch. 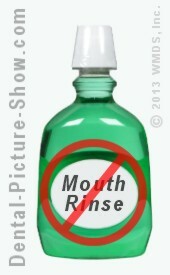 Why isn't using mouthwash as effective? True to their promises, some oral rinses may be able to soften up plaque (make it less adherent) and/or kill oral microorganisms. But neither of these effects is fractionally as beneficial as flossing. Only mechanical debridement (scrubbing and scraping) can remove enough dental plaque from a tooth's surface to have a substantial effect. The comparative ineffectiveness of oral rinses has to do with the nature of dental plaque. Although a layer of plaque may be quite thin, it can be remarkably protective to the bacteria that live within it. Antibacterial rinses may have an effect on the bacteria that live on the surface of plaque but will have a very limited effect on those within it. Why flossing gives much better results. In comparison to the effects of rinsing, scrubbing dental plaque off a tooth's surface by flossing breaks apart bacterial microcosms (organized colonies). And then from that point, the bacteria must begin the process of rebuilding them from square one, which takes time, resources and favorable conditions. This is an important point to note because it's only organized bacterial colonies that cause harm to teeth and gums. Small, isolated numbers of bacteria pose little threat to oral health. So each time you floss (mechanically dislodge plaque), you're giving your mouth (teeth and gums) a period of reprieve where the damaging effects of oral bacteria are lessened significantly. There's even a court case that concluded that using mouthwash isn't as effective as flossing. Even though we think it's easy enough to understand the points we've made above, beyond what we state there's even been a court case that evaluated the evidence on the benefits of rinsing vs. flossing. The case and its findings. In January 2005, Southern District of New York Judge Denny Chin issued a finding that enjoined Pfizer, Inc. (the makers of Listerine Antiseptic Mouthwash) from making the claim in their advertising that the use of their oral rinse is "as effective as floss." Judge Chin stated that he found the clinical studies on which this claim had been staked were flawed and did not support the advertised statement. He also felt that Listerine's ads could pose a public health risk, from the standpoint that they might convince consumers that they did not need to floss daily.